People who are interested in cooking quinoa will be pleased to know that there are a wide range of interesting dishes that can be created with this versatile ingredient. Quinoa is an interesting food. Not only is it packed with nutrients making it a healthy and nutritious form of food, it is also extremely versatile. Quinoa can be used as an ingredient in many dishes as well as making interestingly textured salads and can even be used as a substitute for oats in porridge. Vegetarians and vegans find cooking quinoa straightforward and a good addition to their diet. Many vegetarians and vegans find that quinoa provides a useful alternative to meat in many dishes. It works well in dishes such as chili. The texture of quinoa make it a good alternative to ground or minced meat. Quinoa is also very good for vegetarian or vegan burgers. The bland flavor means that quinoa does not overpower other flavors. Before using quinoa as an ingredient, it needs to be soaked and then cooked. Cooking quinoa is quick and easy. Cooked quinoa can be frozen and this makes it very convenient for occasions when time is short. One popular way of using quinoa is in salads. Hot or cold salads can be prepared with cooked quinoa. Hot salads can include the inclusion of roasted vegetables, dried nuts, and cheese or tofu for a healthy and filling meal. To make cold salads, mix cold cooked quinoa with crisp salad vegetables and add a tasty salad dressing made from lemon juice, wine vinegar and olive oil. Quinoa can be used as a replacement for rice. It makes very successful pilafs and risottos. Black quinoa has a more nutty taste and this makes it an ideal replacement for brown or wild rice. Cooking quinoa in flavored stocks or broths gives the quinoa flavor and this can also be used as a cold dish and makes a good accompaniment to salad dishes. Cooking quinoa in soups makes a thick and wholesome dish. Quinoa can be used instead of lentils in lentil based soups. Add some curry powder to give a warming and tasty soup that is perfect for cold winter days. Make a quinoa soup using lots of vegetables and serve with hot crusty bread and this will make a great main course meal. Quinoa works really well as an ingredient in baked dishes. It adds texture and bulk to items such as muffins, cakes and biscuits. Substitute a portion of flour for quinoa to add a little extra texture. Quinoa is also ideal for people on a wheat free diet. White quinoa is more bland than the black variety and both types work well in baked dishes. Porridge made with quinoa is nutritious and filling. This can make a very healthy start to the day. Cooking quinoa porridge is very simple. Use a proportion of one measure of quinoa to four measures of liquid and cook for 25 minutes to get a thick porridge. Add seasoning such as cinnamon, honey (for non-vegans), brown sugar, dried fruit, and even cocoa powder to make a delicious breakfast. Quinoa is bought by the bag and is available from health food stores as well as an increasing number of mainstream supermarkets. Larger bags may be more economical anddried quinoa lasts for a long time. 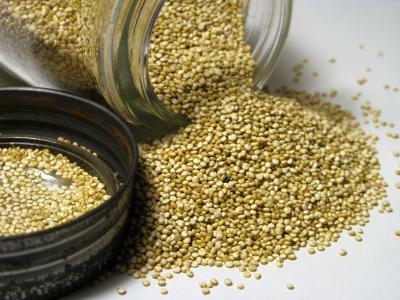 Cooked quinoa needs to be stored in the refrigerator or freezer. Many stores offer an option of black and white quinoa and they are both are perfect for cooking. Quinoa presents many interesting option for the vegetarian and vegan cook. A surprising number of tasty dishes are easy to create from this single versatile ingredient.